Hi everyone! Today Elle and I are spotlighting camo. When I wear this sweatshirt to work, I can almost guarantee that a student or another co-worker is going to ask me if I am going hunting. Even though they ask me each time I wear this top, I still am surprised with how often I wear this top! I love it! 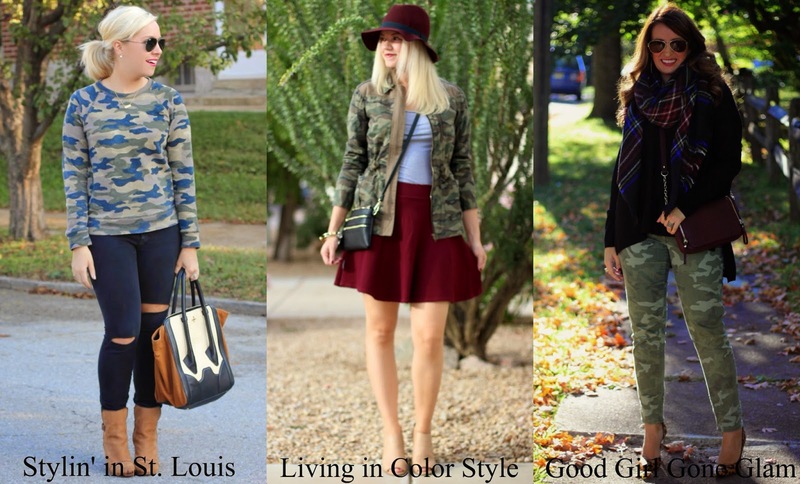 Come link up your camo looks with Elle and I! Spotlight: Our spotlight of the week is Mary-Katherine of gold-hatted lover. The leather look is just perfection! What a great moto-chic look! Her vest is amazing! Be sure to check out her cute blog! Next week: Next week out spotlight weekly theme is fall hats! Thanks for linking up! See you next week! This is such a cute look I am looking for similar jeans too bad these are sold out. Fantastic casual look! Love, love those pants and your lipgloss is a gorgeous shade! I totally remember that sweatshirt at J.Crew. I almost bought it. Looks great on you! Love your sweatshirt and your bag! Such a cute look! Those pants are perfect with the camo! This outfit looks SO comfy, too! Girl, you know I love a pair of distressed black skinnies with busted-up knees! :) This look is awesome; you're a babe! LOVE this camo look! The ripped jeans go perfect and I cant get over those boots! Obsessed! Love your camo sweatshirt & your booties, so cute!! Perfect look for fall. Great fall look - love it with the distressed jeans. P.S. I hope to see you for TBT Fashion link up - it's up on the blog now. i always get asked similar questions! my dad and brother are in the military so usually it revolves around that haha. so glad you wear it anyways because it's darling! thank you so much for the spotlight, y'all are so sweet!! Wow you ladies are rocking your camos like no other!!!! Love how you styled your camo sweater with chic touches of camel!! Love those booties - it's not too late to share those booties at the TREND SPIN-FOOTWEAR I am co-hosting this week at the blog! I am in love with your bag! It is seriously amazing! Thanks for hosting the linkup! I love me some camo!! that is a great sweatshirt!! perfect with the distressed denim! I love your sweatshirt! It looks so good with the tan accents! So cute! Love that camp top and those jeans! I am definitely having a thing for camo, but don't have a sweatshirt yet.